Brilliant. This book... I'm still not sure what it's done to me. I was mesmerized by Unravel. I was consumed by the need to know what was going on and it was unputdownable! Six months ago, I was happy. I was simply Naomi Carradine. One month ago, I was admitted into a psych ward. Yesterday, Lachlan visited me. Kissed me. And told me that I’m starting to lose my mind. Hours later, Max haunted my thoughts, reminding me I’m not crazy and that he needs my help. A few minutes ago, I drifted further from reality, trying to unravel the past. And now...everyone thinks I’m insane. But, I know he's real, and I know he needs me. Do you believe me? I had to use the Goodreads blurb. If I made my own recap I probably would have said too much. This was one hell of a ride. From start to finish, I couldn't tear my eyes away. I had to suffer the whole day feeling like sh*t warmed over because I used the 'just one more chapter' line. One chapter was most definitely not enough. I was constantly thinking up new theories, trying to get a grasp of what was going on... the unpredictability of Unravel kept me on my toes. I wish I could say that I savored every page, every word and took my absolute time reading but I just couldn't. I'm nosy curious by nature so being emerged in this wtf story... there was no way I could survive long without knowing everything. 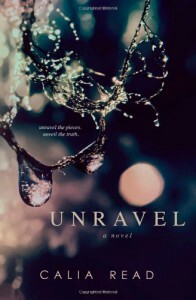 What really solidified the five stars for me was that, while Unravel dealt with some weighty subjects, it didn't suffocate me. I didn't feel like I was drowning in everything. I never felt like it was too much. And despite all the uncertainty and pain, this was also a story about love and healing. If you're looking for a atypical story with mystery and a good dose of some steamy scenes then look no further! “Tell me what you’re fighting and I’ll fight with you,” he whispers into my hair.